SEMS placement is currently an established palliative treatment for malignant upper gastrointestinal strictures with an excellent ability to restore luminal patency. This thesis shows that, despite technical developments and increasing experience, recurrent obstruction and other SEMS-related adverse events after esophageal SEMS insertion are still a major concern. We could not show a beneficial effect of fully covered esophageal SEMS compared to partially covered SEMS in malignant dysphagia. Recurrent obstruction was related to complications other than ingrowth, such as overgrowth and migration. It must also be taken into account that the type of patients that receive a SEMS is changing with more patients being exposed to chemo- and/or radiotherapy. Major complications are seen more often, especially when both chemo- and radiotherapy have been applied. This mainly concerns pulmonary infections and fistula formation, probably due to the chemoradiotherapy-related esophageal and pulmonary injury, and continuous pressure of the SEMS. In this thesis we also highlight the importance of retrosternal pain after SEMS placement which occurs more often than previously assumed. Technical adjustments have also been applied with regards to SEMS for malignant gastric outlet obstruction. This thesis demonstrates good clinical efficacy and an acceptable safety profile of a new uncovered duodenal SEMS within a large study population. 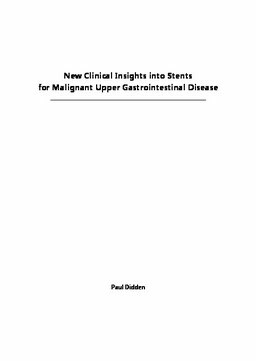 On the other hand, we have shown technical shortcomings of a new partially covered duodenal SEMS. In multiple patients broken struts were encountered, which prompted for discontinuation of the trial. Although duodenal SEMS covering seems to prevent ingrowth, the benefit of anti-migration features remains to be established.